The Yantra, which is described in today's post is a two-fold talisman that can be used for the purposes of either getting love and affection or for the purpose of shielding your body from being killed or injured by an arrow. This Yantra is called as the Baan Se Suraksha Pane Ka Vashikaran Karne Ka Yantra. The specific use of either Vashikaran or Shielding the Body, depends exclusively upon the ink or mixture, which is used to draw the Yantra, which, I have shown in the image of the Yantra given in this post. The Yantra should be drawn and put to use on any auspicious Hindu Tithi, Shubh Muhurat, festival or Jyotish or Shubh Graha Yoga. Once prepared, the Yantra should be kept anywhere on the body, including a locket, purse or pocket after worshiping with the usual offerings of an oil lamp, incense stick and flowers. 1] For use as a Vashikaran Yantra- This Yantra should be drawn on a Bhojpatra using a mixture of Kesar and Kasturi or Saffron or Deer Musk. This ink should be prepared by adding mixing these two substances and adding a few drops of water to prepare a liquid of uniform consistency. A pointed wooden stick should be used as the writing instrument. 2] For shielding the body from arrows- The same procedure described above has to be followed, the only exception is that the ink should be a mixture of Chandana and Kumkum or Vermilion and Sandalwood Powder. 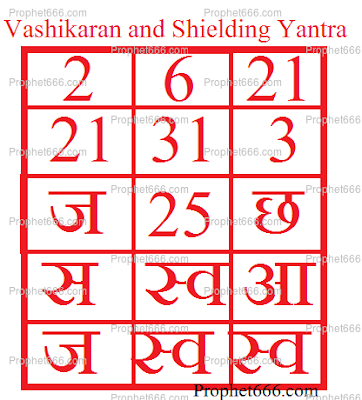 Notes- The Vashikaran variation of the Yantra can be used to make every-person the practitioner meets or has dealings with become friendly, understanding, amicable and co-operative towards the practitioner. The Yantra has its origin in the Shabar Vidya Tantra, which was practiced in the centuries by-gone, In those days the bow and arrow were one of the most feared weapons of war and anyone could be targeted from afar or from a secret hiding place. In today’s times bows and arrow are normally not used as weapons. Do a site search, there are many remedies and Mantras given for that purpose.